No sooner did Microsoft announce its DRM 180 yesterday than some gamers commenting here on Kotaku and elsewhere on the web began wishing Microsoft would do another 180 and go back. The gamers for whom yesterday was bad news appear to be a minority. Few as their numbers may be, I could see them and hear them above the spontaneous celebrations. They have quite the argument on their side: that they were the champions of the future, that they wanted Microsoft to move ahead and that, instead, the new Xbox that they were rooting for has thrown on its retro uniform and decided to perpetuate the past. "Hope the complainers are happy," one reader wrote under a story I did about some of the features Microsoft was cutting or, at best, delaying in order to loosen their DRM and let people share and re-sell game discs on Xbox One the way they did on the Xbox 360. "You wanted an Xbox 360 2 and you got one. I myself was looking forward to a new idea of console gaming system, but oh well." That comment has generated more than 500 replies. Over at our sister-site, Gizmodo, my office-mate Kyle Wagner declared that Microsoft had "caved." Kyle believed that Microsoft's original Xbox One DRM scheme was going to make games cheaper, an assumption for a claim I kept waiting for Microsoft to make in the past month each time they revealed another off-putting aspect of their Xbox One plans—and yet for the possible reason that they had no intention to lower game prices, they never did. Kyle, along with some of our readers and others who were bummed with yesterday's news, recognized that the switch back to a disc-centric DRM strategy may cost some future Xbox One gamers some progressive experiences. They're upset that the family-sharing plan is gone or at least postponed (Microsoft's Xbox Live czar Marc Whitten told me yesterday it wouldn't be there "at launch.") They're disappointed that people who buy games on disc will still be constrained by having to use those discs, by having to put them into a machine to authenticate that they have the right to be playing the game they want to play every single time. Let's call this crew of people who were so disappointed the Xbox One Futurists. They wanted something different and radical. They didn't mind that they'd have fewer options to sell back their games and that they couldn't lend games to friends, certainly not on launch day. They were willing to accept some new pain because they thought it would enable some new opportunity. Sharing games at no extra cost with any so-called "family" of 10! Never having to put a disc in a disc drive a second time! These Futurists are right to lament the Xbox One's aborted plans, but what they're losing seems like small prices to pay to enable people who don't have good Internet connections—or the ability to connect online at will—to be able to play Xbox One games at all. In the next console generation, there will be the disc people and the download people. I'm not sure they're going to get along. I sense among the Futurists a resentment of gamers who think of gaming as something for which you need a disc. This is the divide I think will come and that will likely widen on Xbox One and PlayStation 4. In the next console generation, there will be the disc people and the download people. I'm not sure they're going to get along. The PlayStation 4 wasn't going to have the Xbox One's hassles, because, it appears, the PS4 actually was going to treat disc games differently than download games. As ready as Sony was to explain its PS3-style PS4 disc game policies; Sony spokespeople wouldn't say anything about policies for downloaded PS4 games, all the while hoping to increase the amount of games gamers download to the PS4. May we infer the policies are different? Of course disc games and downloaded games are different, you say. Games on discs are objects that can be handed around. They're not the same thing. It's not that crazy, however, to see Microsoft thinking that that's retrograde thinking. It's only bizarre that Microsoft hadn't figured out a way to offer or even mandate an erasure of that distinction without requiring regular online check-ins. As some readers have suggested to me, why not just give Xbox One gamers the option to authenticate offline by putting a disc in the disc drive? 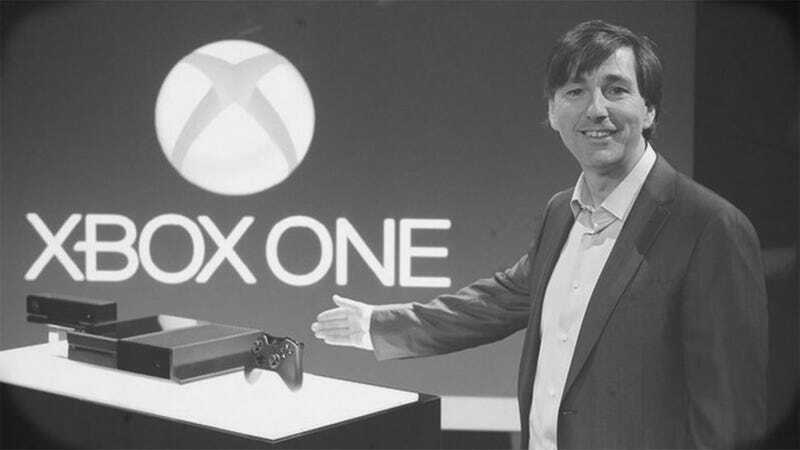 Can't Microsoft let their original Xbox One concept and the new/old/360 one battle it out on their own platform? Microsoft's Marc Whitten was tasked yesterday with talking to Kotaku and other outlets about the Xbox One policy reversals. Repeatedly, he talked about choice. In bringing Microsoft's policies back to the Xbox 360's and in line with the PS4's, there is indeed a relevant choice again. There is the choice to get an Xbox One game on a disc and do what you will with that disc. There is the choice to download an Xbox One game and do... well, Microsoft is now where Sony was last week: not articulating just what gamers who download games will get. That's likely what the Futurists are waiting for. And that's the new big Xbox One mystery: what's really going to happen to all those Xbox One visions of the future of digital gaming? Can't Microsoft offer its family-sharing and disc-free-access-to-your-games-anywhere for those Xbox One gamers who choose to download their games? Or, better, can't Microsoft give disc-based gamers the choice to register their games online and then enjoy the benefits of sharing and expanded access knowing what they're giving up in exchange? Can't they let their original Xbox One concept and the new/old/360 one battle it out on their own platform? Might Microsoft, in fact, be planning to do that—spawning their own Xbox Live Marketplace of Ideas, as it were—and just not want to say that now, since their Xbox One vision had scared so many gamers? It's been a weird sight even for those who are happy about Microsoft's Xbox One DRM plans to see a company appear to retreat. Microsoft is doubtless feeling better about things today. But I feel for the Futurists who dreamed of an interesting, risky approach to a new console even as I'm grateful for those who now aren't going to lose access to Xbox gaming. And I'd like to see the Xbox One's original vision at least get a shot, especially now that it's not being forced on reluctant gamers. Choice would be good. I hope true choice gets a chance.